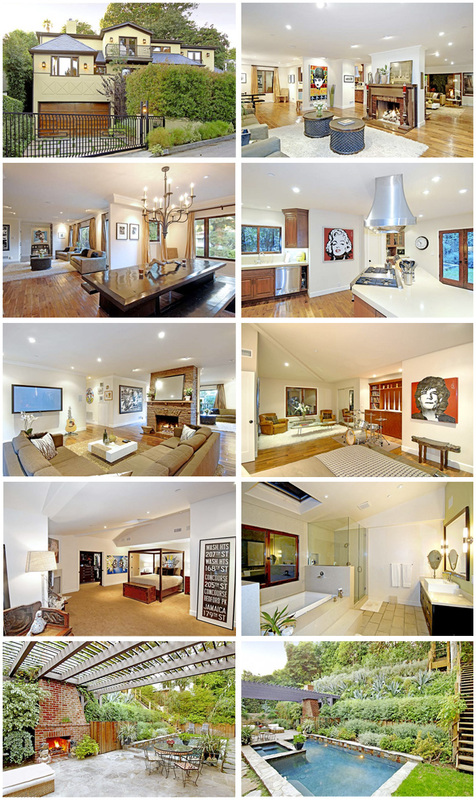 I couldn't resist posting about Frankie Muniz's house which he put up for sale back in 2007. This house is in Los Angeles, California. It has five bedrooms, four bathrooms and an open plan main level that includes living, dining and family rooms plus a roomy kitchen. Modern paintings (one Warhol) in nearly every room and musical instruments here and there. My kids laugh their heads off watching Malcolm in the Middle so I guess this post is dedicated to them! All images via The Real Estalker. I like it. It's fresh and clean and young. And as someone who has grown up with a drum set in the house (father, brother) and still has a set in the house (son), I wish I had as large a room so the drums don't dominate. Thanks for your comments! I like the way the drums look in his living room, though I believe they belong in a garage or a room far away from the rest of the house! Awesome style! The drum set is in a guest bedroom (those are circular wooden tables in the living room). Also, he has the Howdy Doody (Warhol) in the Master above the fireplace, if you look closely. Thanks anonymous! I didn't realize the drum set was in a guest bedroom. It looked like a living room. What I thought was a large rug is actually a bed! (I wasn't referring to the circular tables in the living room!) And I did miss that Warhol! Thanks for pointing these things out to me! You must be a Frankie Muniz fan! Or... OMG! Frankie himself! The drums are his style for sure, but its been photographed to sell, so I'm sure its not exactly how Frankie would keep it. I wish I was that rich. I love the decor. It is amazing. If only I had the money to decorate like that or even own a house like that for that matter. jaja no sabia que tocaba la guitarra o la bateria!